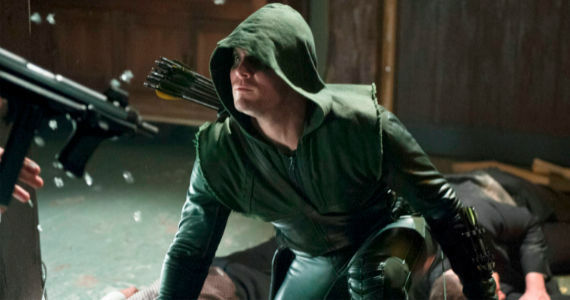 There are many similarities between DC vigilante heroes Batman and Green Arrow, not the least of which is their creative use of gadgets to compensate for their lack of superpowers, and therefore many fans of The CW's show Arrow are no doubt looking forward to seeing a new array of tools when the series returns for a second season this fall. The man hasn't even sorted himself out with a proper Arrow Car yet. In Oliver Queen's defense, he was quite busy last season - managing to finally get off the island of Lian Yu where he had been stranded for five years and immediately going up against a long list of crooks operating within his home of Starling City. The first season ended with quite a bang, and as such we could find the characters in any number of strange places when the story picks up once again. In an interview with Entertainment Weekly, executive producer Marc Guggenheim offered a few fresh hints about what fans can expect to see in season two of Arrow. The vigilante has already demonstrated the use of a few trick arrows, including incendiary arrows, flashbang arrows and hacking arrows, but apparently there's a lot more to come. Says Guggenheim, “The stuff to look forward to the most is all the new toys we’re going to put on the table." That definitely sounds intriguing. Felicity Smoak, Oliver's go-to IT expert and one of the select few members of Team Hood, will also play a pivotal role in the redesign of one of the show's main locations. The Arrowcave's original design was very minimalist; located underneath the nightclub that Oliver opened in a converted warehouse in the Glades, the lair could at best be described as derelicte, and presumably took some considerable damage during the season 1 finale. Felicity probably won't be adding floral curtains and fluffy carpets, though; rather, she'll perform some "high-tech redecorating," meaning that the Hood's upgraded equipment will extend to his vigilante headquarters. Felicity will also be required to do something that she has "never done before and has never been expected to do" in the first episode. The most obvious guess is that she will have to kill someone, but perhaps it just means that she'll be asked to make a crème brûlée. Firefly actress Summer Glau was recently announced as the latest new member of the Arrow cast, playing Oliver's business rival, Isabel Rochev. At this point it's not certain whether Isabel will be a big bad, a medium bad or just a little bad. Malcolm Merlyn was the CEO of Malcolm Merlyn Group, so if the writers are trying to avoid simply cloning him, then opting for another rich businessperson seems like an unlikely way to go, but there are plenty of ways in which they could differentiate Rochev's approach to concocting nefarious plans from Merlyn's. Given all these new teases, there are surely some Arrow fans out there who have ideas about what season 2 might bring, so don't hesitate to share your theories with us in the comments. Arrow returns to The CW on Wednesday, October 9th @8pm.